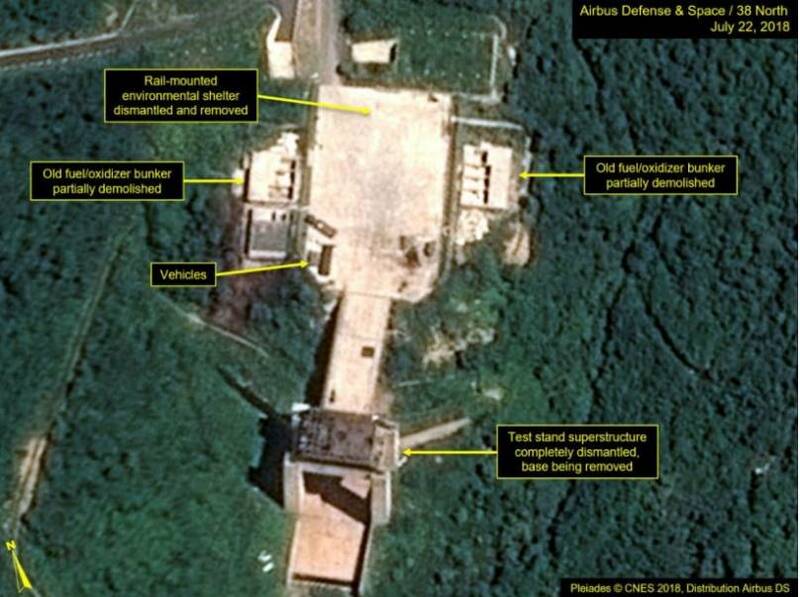 Satellite images appear to show that North Korea has begun dismantling key features of a rocket launch site used to develop engines for ballistic missiles. It’s been seen as the first step towards North Korea's commitment to denuclearisation since the summit with US President Donald Trump last month. 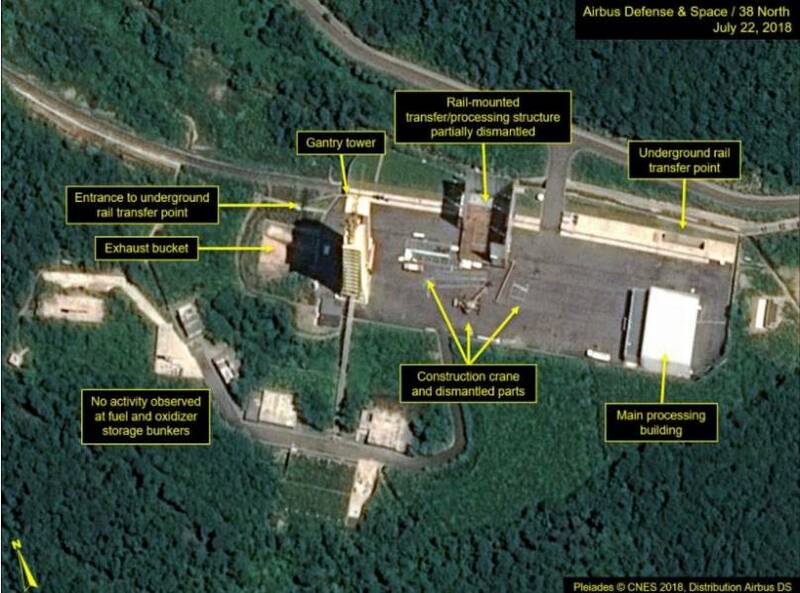 The US-based monitoring group 38 North analysed images of the Sohae Satellite Launch Station, concluding that two key features are being dismantled. Let’s break down the key findings. 38 North says “considerable progress” has been made in dismantling the structure used to prepare and move vehicles to the launch pad. Cranes are pictured next to the structure in the satellite images, next to what appear to be dismantled parts of the structure. The nearby Vertical Engine Test Stand also shows signs of work taking place. Fuel and Oxidizer bunkers are in the process of being demolished, while the steel framework of the test structure has been “completely dismantled”, according to 38 North. On Monday, Trump tweeted that he was happy with progress made with North Korea. “A Rocket has not been launched by North Korea in 9 months. Likewise, no Nuclear Tests. Japan is happy, all of Asia is happy,” the US leader wrote. Nam Gwan-pyo, a senior South Korean official, told reporters: "It will likely have a good effect on denuclearisation." "It is a better sign than nothing, and I believe (the North) is moving step by step toward denuclearisation," he added. Others have cautioned against premature conclusions. 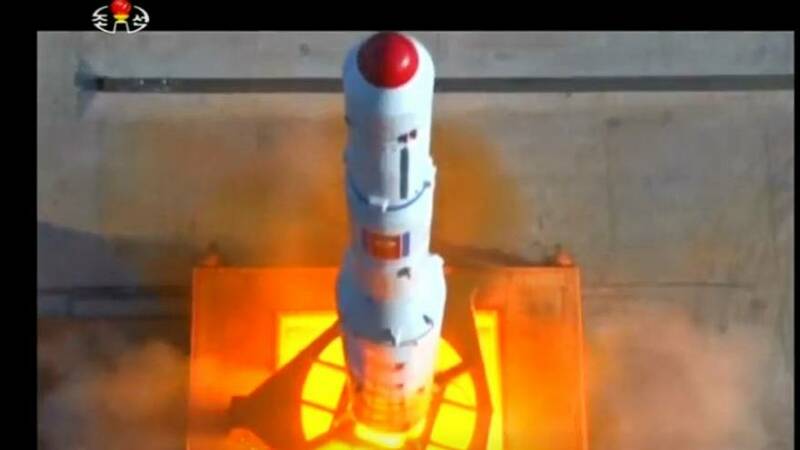 Security journalist Ankit Panda noted that “the missile engine test stand — the long-awaited concession after June 12 [the Singapore Summit] — appears to be in a mostly reversible state. However, without access to the facilities on the ground, no clear-cut conclusions can be reached. Satellite images such as these afford the best, if incomplete, glimpse inside the world's most secretive state.